* 1974 London; lives there. Co-commissioned by Sharjah Art Foundation and New Art Exchange, Nottingham. Generously supported by the Bagri Foundation. Shezad Dawood's work often charts exploratory narratives that draw on historical cosmologies to forge interconnections across far-reaching lines of enquiry, geographic locations and communities. 'Encroachments' (2019), an immersive virtual reality (VR) experience and installation, explores the 'grey area of ownership' and attendant ideas of sovereignty, private property and the politics of space in Lahore and Karachi. The term 'encroachments' refers to the backlash against so-called 'illegal structures' built into and onto existing private and state infrastructure. These structures underscore the lack of social space within rubrics of private and public land ownership and the insufficiently served needs of the entire population. A central element of the VR experience is the proposed building for the US Embassy in Karachi, which Dawood has spent years extensively researching. Designed by architect Richard Neutra in the 1950s, the building now exists in a state of limbo. It was completed after Pakistan moved its capital to Islamabad and then required constant upgrades to meet evolving US diplomatic security standards until it was sold by the US State Department in 2014. On the VR journey to, and onward from, the 'embassy', viewers pass through various parallel environments such as Ferozsons in Lahore, a renowned colonial-era bookshop established in 1894; a secret passage into the Reagan years; and a videogame arcade replete with anti-Soviet propaganda. Each stylistically distinct scene recalls a gaming genre and is punctuated by a different sound track from the late-1960s Pakistani niche music scene of mixed Muslim and Christian musicians, who drew inspiration from classical Indian ragas and the layered sound pioneered by Phil Spector and Brian Wilson. 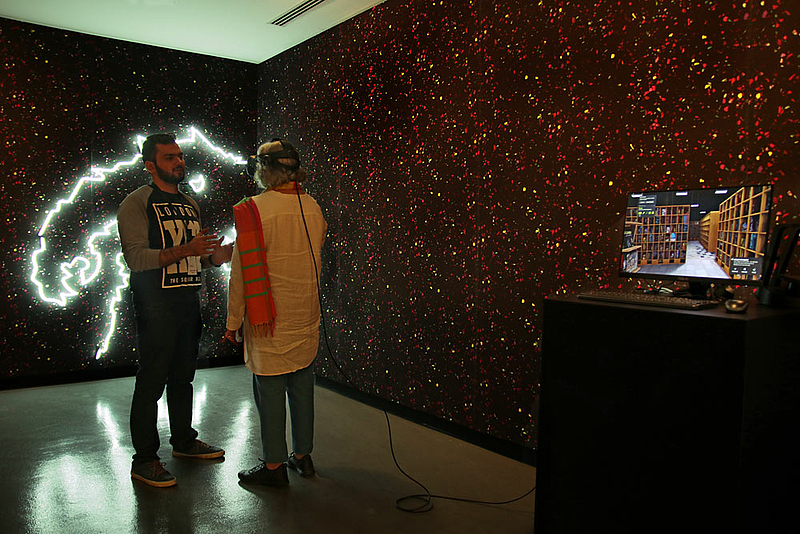 The VR work is presented within the context of Dawood's signature textiles and custom-designed wallpaper of digital terrazzo patterns, which reference the ubiquitous use of low-grade terrazzo in Neutra's US Embassy, 1980s gaming arcades and other places in Pakistan. Seven artists. Making New Time, curated by Omar Kholeif. 7 March - 10 June 2019, UAE.